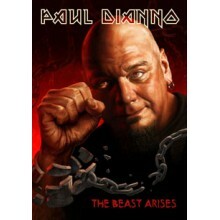 Paul Di’Anno will release The Beast Arises on DVD, CD, and double LP October 7th. This is a live release that was recorded at Lizard Club in Kraków back in April and features Di’Anno singing songs from the first two Iron Maiden albums, as well as material from Killers and Battlezone. I was able to see him perform when he came to the U.S. a few years ago and it was a fantastic performance that made it seem like Di’Anno hadn’t lost any of his vocal range or energy in the decades that had passed since he was in Iron Maiden. Check out a full track listing for this live release below! Paul Di’Anno “The Beast Arises” will be available on DVD, CD and double LP on October 7th. The original voice of Iron Maiden, and the front man of such bands as Killers, Battlezone and Gogmagog, arises to bring his fans a show of sheer heavy metal brutality. Di’Anno returned to Poland in April to play a string of live shows. One of the shows – at Lizard Club in Kraków on April 9th – was recorded for the purposes of a live DVD release “The Beast Arises”. The material from the DVD captures a sensational live show in a club full of audience that would not let Di’Anno leave the stage for a long time. The release features mind-blowing performances of the classic material from the first two Iron Maiden studio albums, “Iron Maiden” and “Killers”, as well as songs by Killers, Battlezone, and, to top it off, a fierce cover of Ramones’ “Blitzkrieg Bop” – all this making for an outstanding show that will leave no fan in doubt that the Beast has truly risen. The DVD also includes an interview with Paul Di’Anno, a photo gallery and other extras. This English singer is best known as the first vocalist to record with the iconic band Iron Maiden, from 1978 to 1981. Despite world-wide success lurking just around the corner, Di’Anno departed from the band by the fall of 1981 (he’s since admitted that he was partying a bit too hard around the time of his departure from Maiden). However, Di’Anno’s unique and extremely powerful voice had made a huge impression on rock music fans the world over, and also gained him an army of fans due to the sales of more than 20 million copies of the first two Iron Maiden albums (“Iron Maiden” & “Killers”) featuring Paul’s unique vocal talent. In his post-Maiden career, Di’Anno has issued numerous albums, both as a solo artist and as a member of such bands as Gogmagog, Battlezone and Killers, and he has been featured (either as the artist or as a guest) on more than 60 albums released world-wide. As a confirmed icon of the metal genre Di’Anno is constantly gigging (with his various bands) throughout all of Europe, USA, Canada, Central & South America, Australia, Asia etc. Di’Anno has even had time to have his first full sized and highly acclaimed Book/Autobiography released entitled “The Beast”, which is a no holds barred journey through his turbulent and often disturbing car crash lifestyle, throughout the last two decades. Although he only appeared on the first two Maiden albums, Maiden’s work with Paul Di’Anno remains among metal’s all-time finest, and to this day those two albums are idolized and thought of as “The All Time Classics” by most Metal fans and musicians alike throughout the World.